Is there a tree in your yard that looks scary to remove? Some can be very tall and towering that just a simple chainsaw can’t take it down without damaging something around it. 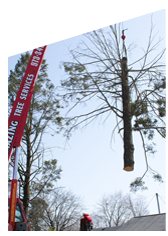 Amazing Tree Service offers a crane service in North NJ that can get rid those monstrous trees. Most of the time these trees need some trimming before they are taken down. Just a few long branches will be removed before we do anything with our crane service in NJ. When it comes time to remove the gigantic tree our crane will get it out of the ground in a safe and efficient manner. We do every job with safety as our number one priority, Amazing Tree wants to make sure no one is hurt during a tree removal in NJ. Using our crane service in North NJ is the safe way to remove those big, dangerous looking trees. Even if it’s just a large branch and not just the whole tree we recommend using a crane over just trimming it off and letting it fall. Our expert tree crane operators in New Jersey will come for free and inspect the situation, offering a free estimate before moving forward. If you’re in need of crane service in North NJ to remove a large tree call Amazing Tree today at 973-343-6868 and speak with a tree trimming expert today. A stump in the ground can become very dangerous and hazardous to the things around it. Over time a stump can rot and poison the soil making it difficult for plants to grow in that area. A rotten stump can cause a sinkhole in your yard, starting an issue of tripping or falling. Amazing Tree offers a stump grinding service in NJ. If you have a tree stump that is fairly new or has been sitting there for quiet sometime it may be time to have it removed. Here at Amazing Tree we can remove tree stumps in the matter of no time. After removal we supply stump grinding in NJ to get rid of every piece of the stump. This makes it easier to remove and transport. Sometimes a stump could be removed in one piece but often it needs to be grinded up for all of it to come out. Having a tree stump grinding service in NJ can benefit you a lot. You will get the stump out just in time to plant a new tree, batch of flowers or grass. Your soil will stay healthy welcoming anything you plant in it. A tree stump can decay over time and to stop that from happening, have Amazing Tree’s stumping grinding in NJ take care of it for you. If you’re interested in stump grinding service in NJ give Amazing Tree at 973-343-6868 we are available 24/7 to give you a free estimate and make sure you’re safe. Heavy rain and rough winds can damage a tree over time. This can cause tree branches to snap and break off, falling into your yard. This can be very hazardous to everyone around. One of the branches could fall and hurt someone or damage your yard. Amazing Tree Services offers Tree Trimming in Chester, NJ. Tree Trimming in Chester, NJ could be done to trim off the branches and make your tree look new and fresh. We will come and inspect the tree seeing which branches should be removed. It is very dangerous to keep rotten or broken branches on a tree. They could easily break off and fall on your home or someone. Amazing Tree Services promises to give you a safe and efficient tree trimming service in Chester, NJ. We have a fully professional and insured tree trimming service in Chester, NJ. Our tree company has all the right equipment to safely remove a large tree branch that won’t harm you or the tree. We will keep the tree nice and healthy by just removing the bad parts. Call Amazing Tree Services today if you have a branch in danger of breaking off. 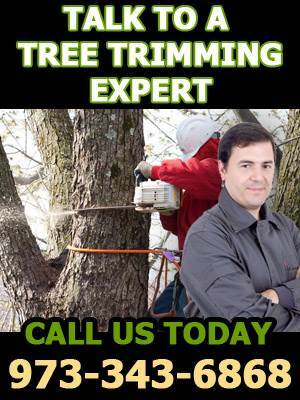 A tree professional will discuss your options for Tree Trimming in Chester, NJ and other tree services available. Full grown trees on your property can add as much as 10% to your property value. However, if a tree is sick, or starts to weaken, it become a tremendous liability to you, your family, and your home. The experts at Amazing Tree Service have these tips to determine if a tree is a potential threat. Check around the roots – The root system is the anchor for all plant life, and an indicator of the trees overall health. Take note of any cavities, hollows, or cracks in the root structure. If you notice the soil raising on the opposite of trees lean, it may lead to the tree uprooting. Before the tree falls, it is important to call a professional tree removal service in NJ. Check the trunk – The entire tree can crack or split if there is a large enough cavity in the trunk. Look for places on the trunk where there is no bark, this indicates a dead section. Insects will often target an ill tree’s trunk because the wood is softer. Overtime the insects boring into the wood can leave a major cavity in the tree’s trunk. Tree removal in NJ is the only solution if the cavity has become too large. Multiple trunks – Trees with multiple trunks can become unstable. V or U shaped multiple trunks are weak points in mature trees. The connective wood in the area may lose strength over time, making it more likely to split. The risk is increased if the tree is older, or there has been a recent storm. Amazing Tree Service wants you to be proud of the trees on your property, but more importantly wants you to be safe. If you fear that a tree is in danger of uprooting, or splitting, we offer expert tree removal in NJ. If you would like to know more about tree removal in NJ, call Amazing Tree service today and speak with one of our professional staff members. For many allergy sufferers, pollen season can be a vicious time of the year. For people with allergies to pollen, their immune system treats the pollen as an invader and responds by producing large amounts of antibodies. This allergic reaction can cause: itchy/watery eyes, runny nose, itchy throat, hives, fatigue, and irritability. Oak – There are roughly 600 different species of oak trees in the world, making them the most familiar tree on earth. Unfortunately for allergy sufferers, they are also some of the most allergenic. Since Oak trees are ubiquitous, there is little hope in escaping their pollen threat. Simple pollen avoidance is the best plan, such as closing windows and avoiding outdoor activities between 5-10 AM. Birch – Second on the list of the most allergenic trees, birches quick growth and rapid reproduction make them increasingly allergenic as they multiply. The tall, alabaster trees have a distinct aroma and are at their worst in large numbers. If you have a single birch on your property, and allergies, it would be wise to find tree removal services in NJ. Ash – The pollen from ash trees is considered to have between moderate to high potential for allergy. Ash trees range from Nova Scotia to Florida, affecting every allergy sufferer along the way. When wind picks up, dry pollen is sent through the air and can spread for miles. It is important to know what trees trigger your allergies. It is possible to be tested and find out which trees affect your allergies the worst. Once you do, you can make a plan to avoid their pollen. If there are trigger trees on your property, it would benefit you to find a tree removal service in NJ, such as Amazing Tree Service. We are a team of professional tree removal experts in NJ that stress the importance of safety, and efficiency. If you would like to know more about our tree removal services in NJ, call Amazing Tree Service today and speak with one of our professional and friendly staff members.